Pilates focuses on core muscles that provide support for the spine and help to keep the body balanced and strong. 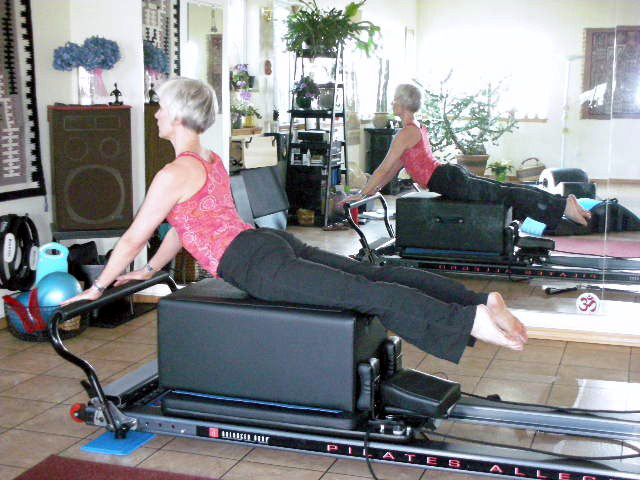 Pilates programs at Volk’s Yoga and Pilates Studio utilize sophisticated and specialized equipment such as Reformers, springboards, Mve platform chairs, arches and orbits. Pilates training begins with one or more personal training sessions taught by the studio owner, Jeany Volk. These sessions prepare you to work with the equipment safely and help you to graduate quickly from newbie to beginner. To sign up for introductory Pilates training, please complete our Personal Training Request form to let us know a little about you. You may want to select your class in the calendar below to add it to your personal Google calendar.